OKAYAMA -- A high school baseball team captain in flood-hit Okayama Prefecture was encouraged by his parents to play on despite the devastation, and take part in the regional preliminaries of the National High School Baseball Championship. The qualifying event is being held for the 100th time here, just a week after torrential rains severely damaged parts of western Japan. 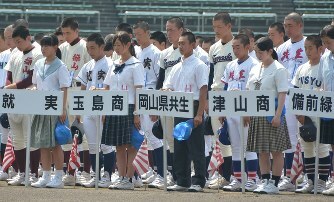 The opening ceremony was held at Kurashiki Muscat Stadium, where athletes offered a silent prayer to mourn the victims of the disaster. Third-grader Shoya Imoto, captain of the baseball team at Okayama Sanyo High School baseball team in the prefectural city of Asakuchi, grew up with his parents and two siblings in the Mabicho district of Kurashiki in Okayama Prefecture. Last summer, he was chosen as a cleanup hitter and led his team to the National High School Baseball Championship at Hanshin Koshien Stadium, where they were defeated in the first round. In spring this year, although he hit a homerun, his team also lost in the first round of the National High School Baseball Invitational Tournament. He then dedicated himself to tough training in order to "win a championship at his next Koshien event." However, his house in Mabicho was engulfed by floods on July 7. "It's all messed up," said Imoto on July 9 as he entered his house after the devastation. Everything was covered in sand and mud -- from a baseball glove he first used to play catch with his father, to a box holding commemorative medals he received for taking part in Koshien tournaments, to the bicycle he used to ride to school every day. Frustrated, he dug through the rubble and found a soggy photo of his smiling family. All of his family members had survived, but the flood left him wondering if this was the right time to be playing baseball. Sensing Imoto's conflicted feelings, his 43-year-old mother said to him, "We can clean up anytime. Now is the time for you to play baseball, which you have worked so hard to do." After hearing those words Imoto made up his mind to play on. After Imoto's family evacuated to a relative's house in Okayama Prefecture, his 47-year-old father drove him to baseball practice, while his mother made his lunch. Imoto is very thankful to his parents who he feels, "should be hurt the most," but who ease his stress by telling jokes. Neighbors also were concerned about him, asking if he was able to attend practice. The championship flag received for winning the regional preliminaries last year was returned at the opening ceremony of this year's qualifiers. Encouraged by his parents, Imoto will take part in the team's first game on July 14. "I want to do my best as a representative of Mabicho," he said.